Home News CM Punk To Be Returning To The Octagon Soon? UFC welterweight Phil “CM Punk” Brooks at Roufusport Academy in Milwaukee on Aug. 29, 2016. CM Punk To Be Returning To The Octagon Soon? CM Punk’s MMA coach Duke Roufus has been teasing the return of Punk to the octagon dating back two months ago. 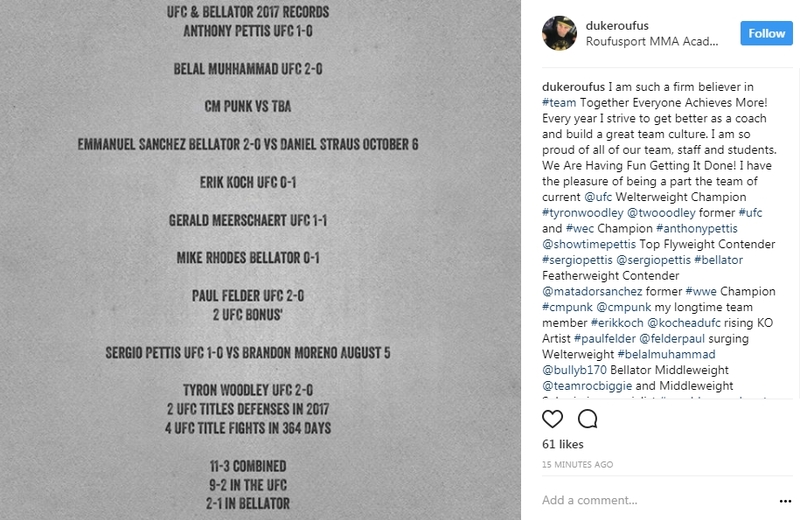 Back in late July, Roufus posted the following photo of a fight card which had CM Punk’s name on it with an TBA opponent. Yesterday, Roufus posted a photo onto his Instagram of him wrapping up a training session with CM Punk, which has caused the rumors to make their rounds that the “Best In The World” may be getting his second shot in the octagon soon.